So much for being in "great shape," as I said Sunday. Word just got out from Yankee Stadium that CC Sabathia is headed to the disabled list with a Grade 1 strain of the adductor muscle near his left leg. He's expected to miss two starts and return after the All-Star break. Freddy Garcia will start in his place Friday. 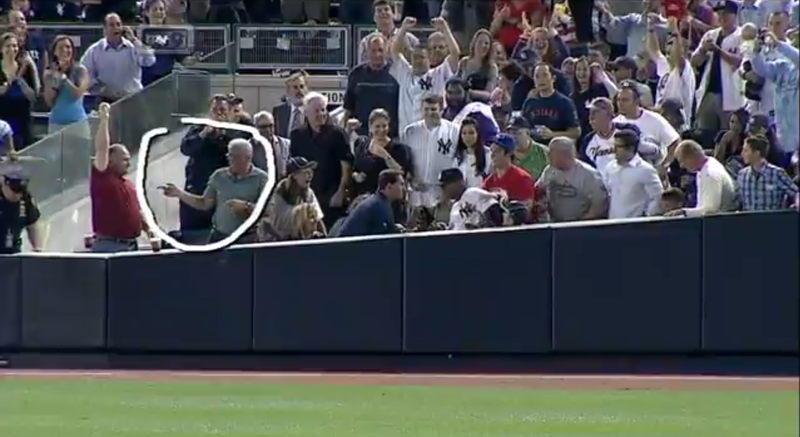 When a player tries to catch a ball that lands in the stands, it should be the nearest police officer's job to make the call. It's his turf, and umpires clearly don't have the better angle. Dewayne Wise dove into the stands last night in an attempt to catch a fly ball. When he came out, he simply showed the umpire the ball his glove and the batter was called out. Watch it here. 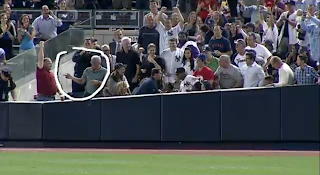 Umpires didn't care to pay attention to a man in a red shirt holding up a baseball, and another guy pointing to him, perhaps giggling at him. Will Jeter, Rivera or Pettitte leave Yankees? When you're with one organization for 11 years and make such a great impact on and off the field, it's hard for fans to let go. Such was the case with Kevin Youkilis and the Red Sox yesterday. The Yankees might have a few of those moments in the next few years, and it could be even harder for Yankees fans because I'm talking about future Hall of Famers Derek Jeter, Mariano Rivera and borderline HoF'er Andy Pettitte (again). One part of the linked article above by former LoHud Yankees blogger Peter Abraham stood out to me, and I think it's something all Yankees fans should read. Nomar went. Manny went. Pedro went, Johnny went. They all go eventually. All four Sox greats left Boston in the 21st century. In the 20th century, Gehrig never went. Neither did DiMaggio, nor did Mantle and nor did Williams. Back in the 21st century, Posada never went. It makes you wonder: What will happen to the rest of the Core Four? Finally, I have a second to post here, and it's a good one, too. As posted on Boston.com, I present Kenyan students reenacting Bill Buckner's infamous play nearly 16 years after it happened.